PDR is a more and more common technique used by auto body repair shops as it is a faster, more efficient and less expensive method of repairing minor dents, creases or dings. The techniques is based on the use of body picks and metal rods, which push out the dents from the underside of the panel. It can also be performed from the outside, using specially designed tabs and glue to pull the dents out. Once these steps are complete, a fine tuning is required, which oftentimes involves removing high spots by tapping down the repair. 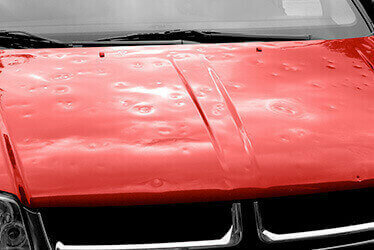 Not all dents or damages can be repaired this way, so contact our specialized technicians at CARSTAR #15054 in Catskill, NY to learn more and have your vehicle assessed. If PDR is the right technique for your vehicle, then it should be ready in 2 to 3 days, which is one of the great benefits of paintless dent repair. A vehicle may go through many repairs or maintenance work during its lifetime and having the same qualified, experienced and skilled technicians performing these repairs can keep your car more on the road than in the shop. Finding the best place for your car that provides a wide range of services is therefore essential. Here, at CARSTAR #15054 in Catskill, NY, we offer not only paintless dent repairs, but also hail damage car repairs, 24/7 accident assistance, fleet services and auto collision repairs. We are by your side every step of the way, liaising with insurance companies, tow services, car rentals, dealing with paperwork and anything else you may need so that you don't have to turn anywhere else. Contact us today!